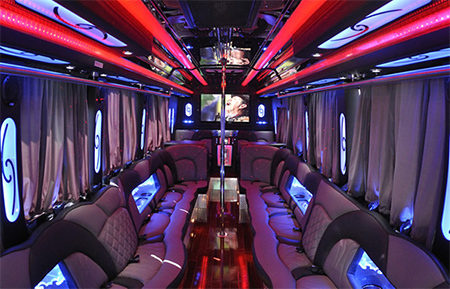 Our Prom Party Bus is an ideal service for a larger group looking to embark on a highly anticipated evening in style. Our drivers have years of experience and we know how to take care of our precious customers so they can simply relax and enjoy our service offering safely. You will have as much privacy as you want because our driver’s section is completely closed off from your seating area. For Prom night you can book a Party Bus for 20 people including comfortable couch seating and a fully equipped entertainment system. This is a great way to get the party started on the way to your Prom venue or to end off the evening before heading on home. Get your class mates together and arrange to go out with a bang this year. Starting at just $120 per hour for a minimum of two hours, you can even share the costs of such an exceptional ride. (reasonable fuel surcharge will be added to the bill). Take a look below at our additional services that we can provide. While you contemplate how many friends you would like to have at your party, consider our non-acoholic drinks packages that can be included in the occasion. We take our social responsibilities as seriously as we do your safety and satisfaction when utilizing our services. If you do not want the night to end just yet, and would like to tour the city, see a show, or stay at a hotel room we can assist you in making that happen. Whatever your requirements are our Prom Party bus tours are available for you. Give us a call to confirm your booking and tell us how many hours you would like to book your trip for and we will advise you of the costs involved. Discuss our additional services with our friendly professional staff who are happy to assist.